As many of you know, I'm a bit sad that summer is soon over. Perhaps it is not so much that summer is coming to an end, but that all my feathered friends' actions in my backyard are winding down. The cardinals, blue jays, starlings, finches, grackles, robins, chickadees, cowbirds, woodpeckers, doves, sparrows, titmouses and those sweet sweet little hummingbirds. All is quiet. For over five months, I've watched them court and romance one another, mate, nest, and hatch their young. I found fledglings that fledged too soon. Observed a sparrow raising a cowbird and got a hummingbird to sit on my hand. I saw too many house finches with the fatal eye disease and lost a couple of doves to a hungry hawk. And then there were all those fledging teens with their insatiable appetites. Most are all gone. But there is still one hanging around. 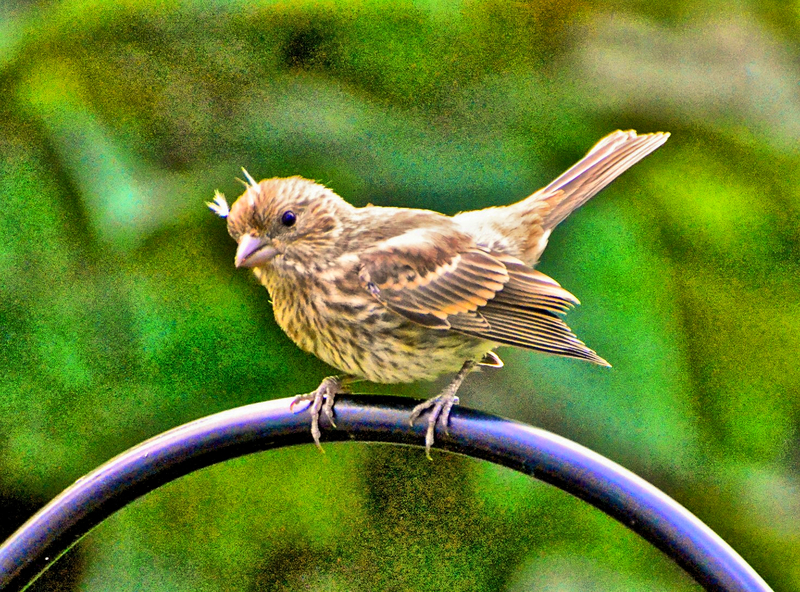 A little house finch. A definite late-in-season-hatching. 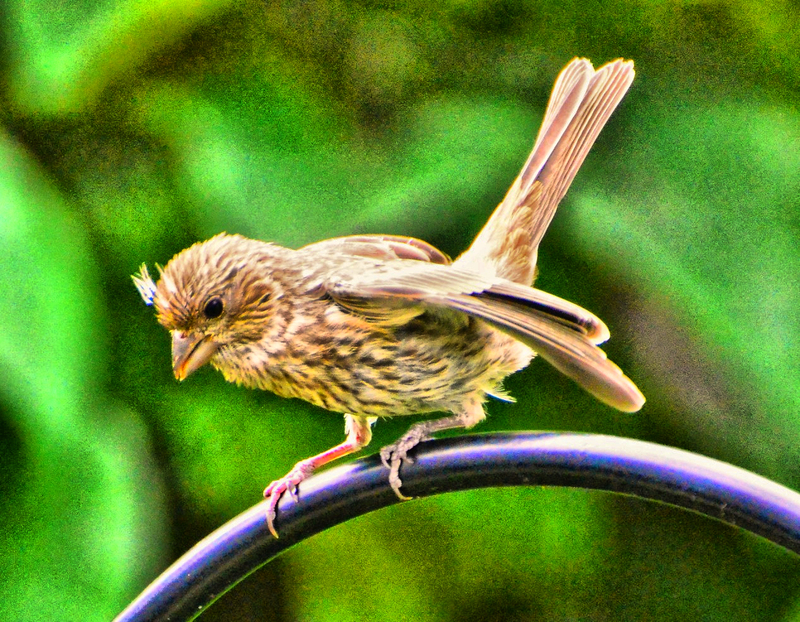 He caught my attention last week with all his ruckus at his mother who was feeding at my feeder. That's him below. He carried on something awful. He was rather cute, with his little tufts of baby feathers that still clung to his head. When he couldn't get her attention, he flew down landing awkwardly on the feeder and begged her from there. He was so obnoxious she finally flew away! Minutes later, they both returned, mother first and then the little one. Still chirping away at her! 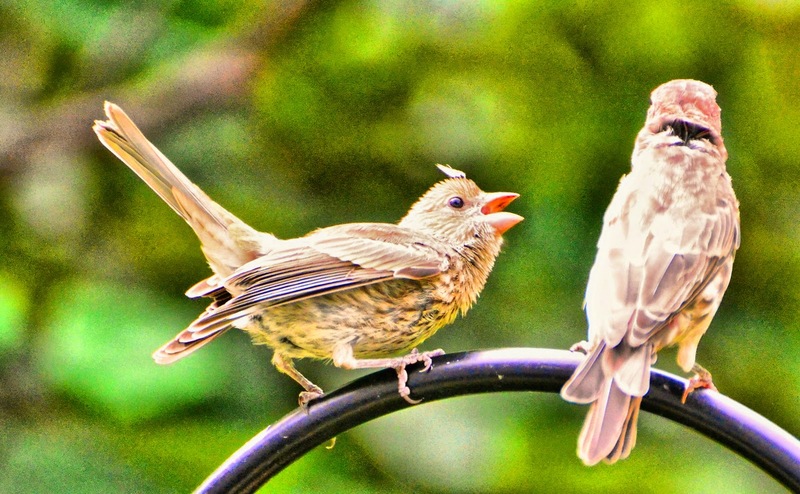 All I can imagine was that she must be trying to illustrate to him how to feed from the feeder. But he just didn't seem to be getting the message. Well, she must have been successful, because here is yesterday. Still sporting that little tuft of feather but now alone and feeding. Quite well, I would say, by the size of him. No more chirping and squawking going on. And no signs of his mother. He's on his own. Sort of sad when your babies leave. I miss them. Even more than summer. What a lovely post and beautiful captures! I do know and relate to what you have written, Reena. I have four children, two boys, two girls and watching them grow up and move on to quite wonderful lives is very rewarding, but I do look back at the fun times we all had when they were growing up and, yes, I miss that! Have a lovely weekend! Yes, yes, yes. Your analogy made me wistful. There are some who never leave the nest. I agree with the Mother bird; sometimes you have to use tough love. Oh that little face with those errant feathers.. so darn cute. They'll be back next year. And plenty of them mentioned in your list will stick around all winter. Don't be sad, they will be back next year. Anyway, there must be the winter birds instead. beautiful images but a little sad when we think they will go.But Bob is right,they will be back next year. These photos are stunning. I especially love the one where his wings are spread. Just a sweet, albiet, loud little bird. 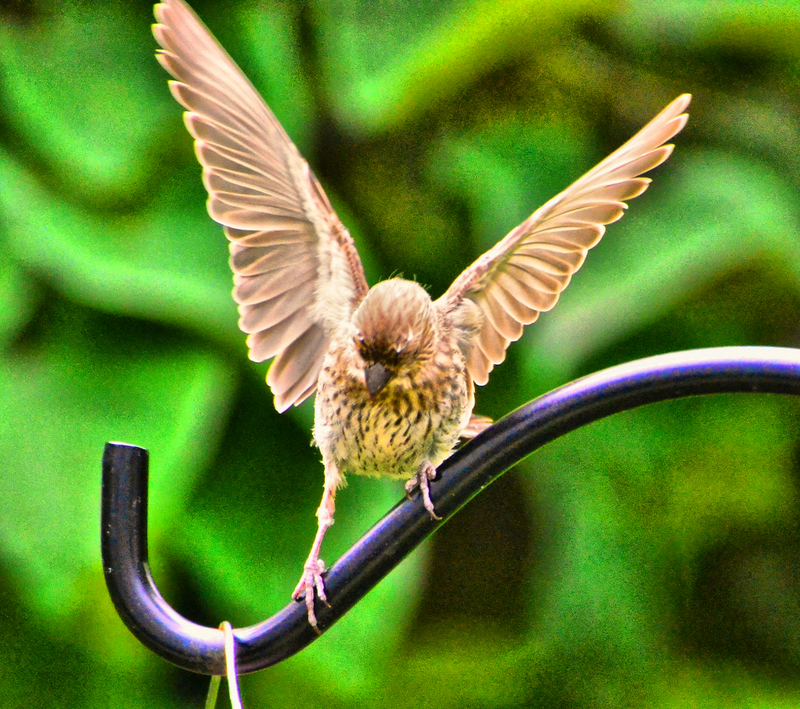 I love that picture of him landing on the feeder. The landing may have been awkward but the photo is awesome. It is sad that summer is on it's way out. I'll miss it and my bird friends. Great photos and words! Always a treat to visit here! It's always sad when the bird numbers start winding down, I love watching them too. Momma bird does look weary. I remember those days. LOL! Beautiful pictures and you have a great view through your window. It's quiet here too. The birds have disappeared and my oldest is off to college. Reena beautiful post about our fine feathered friends near and far. Rest assured..Mom will take very good care of any of your friends who decide to winter in N. C.
Ahhhh.. What wonderful photos of that sweet little bird and her baby.. Your yard is gorgeous.. I wish I had all the grass.. So green and beautiful.. I do hope you have a happy day! and then you're sad they're gone. I love that last picture looking at your yard through your window! He is very cute! So funny, as he is now bigger than his mom! I guess he needed to get really hungry before he would try the feeder! I am always surprised by how expressive birds can be. Our birds had that eye thing a few years back. 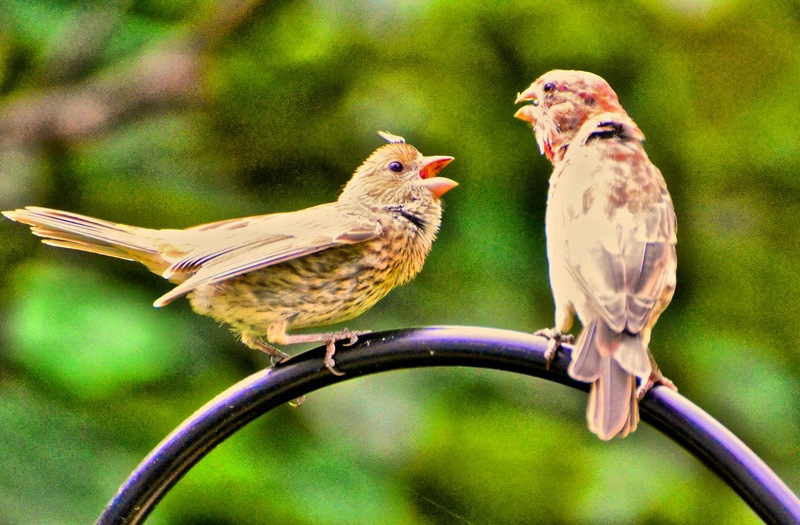 It is very contagious and the only way to stop the spread is to stop feeding the birds...less interaction. Kinda sad. My birds never leave, in fact the cold weather brings a renewed frenzy at out feeders, especially when it snows. They come by the hundreds! Very hard to find food under the snow. Also if you provide fresh water, they will love you all season. Kind of makes you wish that you were a "bird Whisperer" ,lol. And fall for me is very welcome because of the cooler weather. And after living in Florida for almost 23 years i really welcome to cool-off. Richard from Amish Stories. I'm with you. I'm really missing summer already. I still have plenty of house finches. No more gold finches though. Can these guys eat or what??? I fill my tube feeder to the top and it is gone within3-4 days. Glad that baby figured out how to get dinner before he had to start flying. When I was working in Wisconsin this summer, I got to watch a mom robin and her babies right outside my door. The nest was on the other side of the door to the deck. I became obsessed about them and worried about them when they fledged. It was almost too much because I would constantly look out the window for signs of them and I saw a cat stalking them. Of course, I ran out and shooed it away, but I obviously couldn't watch them 24 hours a day. I was very sad when they took off on their own. I totally understand. Oh, I know how you feel. Everything has suddenly gotten so quite. I miss that flurry of activity, and their wonderful songs. I don't know, maybe if we had them all year, we would not appreciate them as much. These are wonderful photographs Reena. It's a sad right of passage that these birds go through and it's hard to witness! 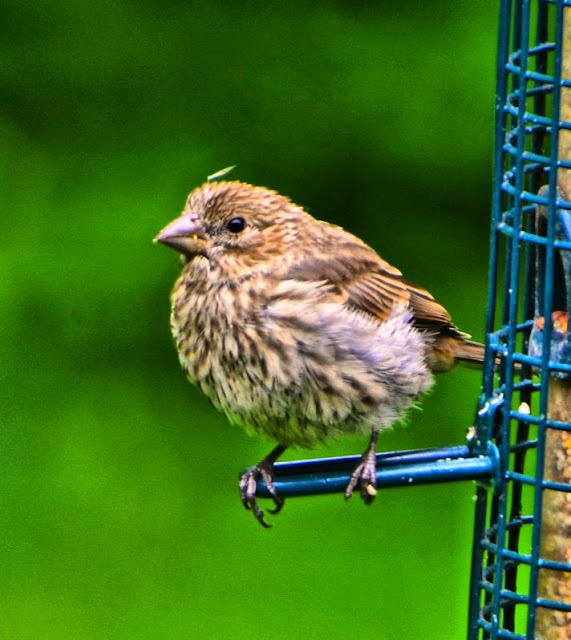 But I have a feeling that as long as your feeders are there, this little fledgling will be just fine!! I have certainly enjoyed your bird stories and photos and will miss them, too! 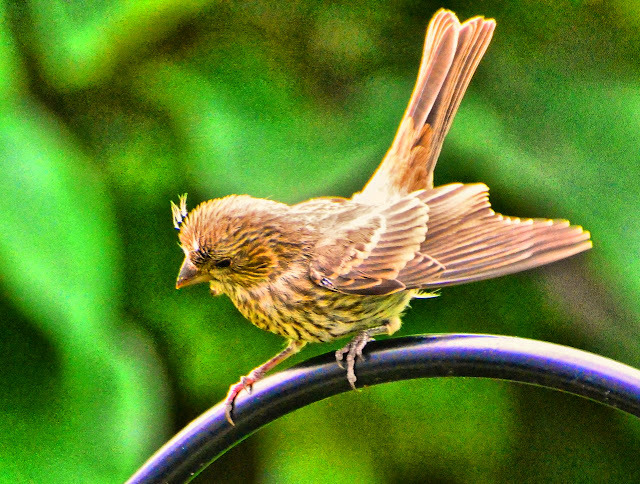 The house finches around here are so feisty, full of personality. These are all great shots; love the one with the teenagers wings spread. Such beautiful photos of your little baby. That is sad that he's leaving, but you sure have lovely photos to remember him by! I am sad all my birds will soon be leaving too. I sat outside after work this afternoon for an hour, drinking tea and watching the finches and nuthatches. those little ones can be soooo demanding!! my hummers are gone but most of my other feathered friends stay for winter!! gorgeous view from your window!! And the photo of him posing on the hook, one foot down, is fabulous (they're all great). Maybe he was just being a little lazy and expecting to be fed rather than do it for himself. It reminds of the baby blackbirds in my garden. One of them refused to move round the garden after his dad and therefore didn't get any food. 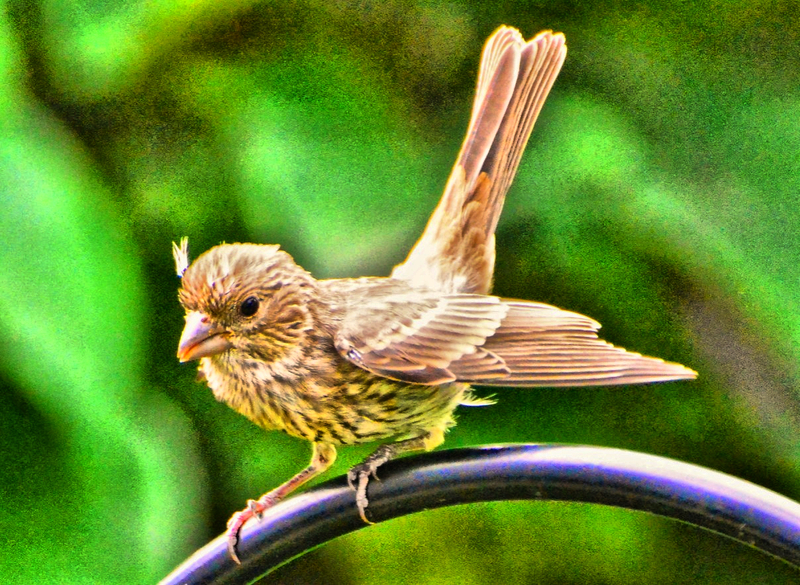 Cute shots of your juvie finch. I loved watching all the babies and juvies. I will miss them too. Your shots are amazing! The good news is that new babies will be back next year! And I will miss seeing them too, beautiful post!! They really are beautiful. Lovely Lovely captures. Sensational photos and colours Reena. 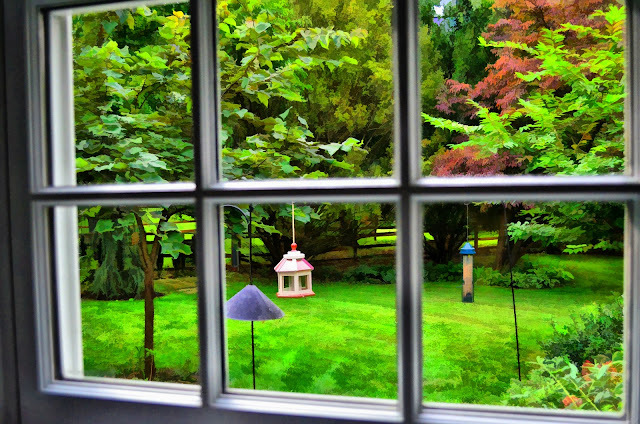 Love the last view of your delightful yard - no wonder the birds and wildlife love it. I guess that it's that time of the year. It's time for them to migrate to warmer terrain. Perhaps you should consider a trip to the far east during the winters. Love the post! Love the story! and love the last line! Yes, it's quiet here, too. But, never fear, soon the Winter holdovers will show up, along with the jucoes, and, maybe, if you're really lucky, an incursion of common redpolls. Though, be careful what you wish for there, they can eat you out of house and home in nothing flat. The chickadees and the titmouses (titmice?) will stick around, along with the cardinals and the mourning doves. I don't know what happens to them in the Fall, but they'll be back, or their Northern cousins will, at least. Yes...sad when the babies do leave. These late-summer ones are so cute!! Your summer visitors may have left, but winter visitors will soon take their place. I don't do as much bird watching in summer because #1 we can't keep seed out here in summer due to attracting bears, and #2 the leaves make watching them difficult. I actually look forward to winter bird watching. The birds are more dependent on us for food, and will often eat out of your hand if you are patient. He's a cute as a devil. And he looks quite plump now. He got that big in one day? What are you feeding them birds. But great because now due to your loving touch and care they will make it through the long winter. Cheers reena! !